Among Christian people there are many varying opinions about what holidays to celebrate, how to celebrate, and such. “One man esteemeth one day above another: another esteemeth every day alike. Let every man be fully persuaded in his own mind. He that regardeth the day, regardeth it unto the Lord; and he that regardeth not the day, to the Lord he doth not regard it…”(Rom 14:5-6a) Many consider Halloween, Christmas, and Easter to be just a holiday in which to celebrate. It is true that they are all pagan holidays. Therefore as Christians, in raising our children we do not celebrate the pagan holidays. The rule is simple in our home. Only observe that which points us and others to Christ. Therefore, as the world celebrates Santa Clause, reindeer, and elves, as believers we celebrate the birth of Christ. As the world celebrates Easter bunnies and the pagan goddess of fertility, we celebrate the resurrection of Jesus Christ. As the world celebrates Cupid and arrows on Valentine’s Day, we celebrate God’s great love. Each day being a special reminder of God, His Son, and the great love for mankind. Which brings us to the celebration of Halloween. Can the celebration of Halloween point us and other’s to Christ? No. In fact, it does just the opposite. The world celebrating Halloween is not the issue of discussion. After all, one would expect the world to do worldly things. But, Christian people are peculiar people, set apart from the world. True believers in Christ do not love the world or the things of the world (I John 2:15). Why, then if over 80% of Americans claim to be “Christian” are we celebrating this holiday? Why is Halloween the second most decorated holiday in our country? Is this a holiday that can point us and others to Jesus Christ? There are three reasons that I believe Christians celebrate Halloween. The first reason is simply that they do not know the truth. That have never been taught the origins of Halloween. You see, like most people when my first child was born I went along with the flow of the tide. When Halloween came around I found a costume for my baby like everyone else did and took him to get candy. No harm in that! No bothered conscience. But the second year, I remember taking him to the mall on Halloween. The absolute evil and oppression present was astonishing. It was then that I questioned why I was doing this. I started my research in the place that all Christian people should – the Bible. It didn’t take long to know the will of God in this matter. The question then came. What was I going to do with this knowledge? Which brings us to the second reason Christian people celebrate Halloween. They know the truth and do not care. Did you know that a person can justify anything? They can read in scripture to abhor evil and to abstain from even the appearance of evil and yet somehow justify in their mind and heart that what they are doing is not evil. Unfortunately, the average person’s mind is full of the world (Mark 4:18-19) and their heart is deceitfully wicked (Jer. 17:9). But amazingly, we will trust our hearts and minds over the very Words of God. A person will read in scripture that we are to be separate from the world but yet they will justify in their hearts their love for the things of this world. Did you know that we are called to be the light of the world? A city that is set on a hill cannot be hid. Do you know why a city on a hill cannot be hid? It is because the light is separated. A person wondering around with the masses trying to shine their lighted jack-o-lanterns with the rest of the world will not give off much light, but take a person who is called out, a peculiar person, a holy person, a chosen person (I Peter 2:9) and set this person up on a hill for all the world to see. The third reason and saddest of all is that those who claim Christianity are not true believers. Therefore, they cannot help but be workers of darkness. Without Christ there is not capability of righteousness. Can we judge someone’s salvation? NO. But they can and should before it’s too late. Examine yourselves, whether ye be in the faith; prove your own selves. (2Co 13:5a) We are called to be fruit inspectors who look at the fruits of those who claim Christianity. And an apple tree that produces figs is not an apple tree no matter how much it claims to be one. As professing Christians, we teach our children that every word, every action and every deed should be done for the glory of God. To celebrate (observe, show happiness, mark an occasion) Halloween can in no way bring glory to God. Churches often participate in this holiday. There are those who have Halloween parties to “bring in the world” and witness to them. It is due to a damaging pragmatic thinking of “we must be like the world in order to win the world.“. When a person tells me that they will use this evil day to witness to the world my question for them is, “Are you witnessing for the Lord on all the other days? Do you hand out tracts and talk to people about their salvation the rest of the year?” A person trying to get another person saved while participating in Halloween seems to be equivalent to a doctor taking his dying heart patient to Krispy Kreme Donuts to discuss the importance of eating healthy foods. The message would be looked at in disgust. This might explain why the world looks at the message of the church in utter disdain. So, my question for Christians who celebrate this holiday is why? Are you truly a child of God, do you just not care about God’s Word, or have you never searched out the truth? For those who truly want to know the truth and who are willing to search out God’s will I encourage them to open the Word of God. Open His precious Word, not with intents to trample on it but in a humble spirit. For in reality, God’s ways to a true believer are not grievous. His ways are light, His ways are worthy, His ways are above all others. My husband found this article several years ago while working with the youth in our church. We are not sure where it came from but is very good. For those who are seeking the truth continue reading…. Halloween – Can it be an entirely innocent practice? What is the origin of Halloween? It is generally agreed that in the church history Halloween took the place of a special day celebrated by the ancient Druids who was the priestly class of the Celtic religion. Our modern Halloween appears to initially be traced to their winter festival on October 31. The Celts and their Druid priest began their New Year on November 1, which marked the beginning of winter. They apparently believed that on October 31 the Lord of Death gathered the souls of the evil dead who had been condemned to enter into the bodies of animals. Thus they believed that on their New Years Eve (October 31) ghost, evil spirits and some say witches roamed about. On this night evil or frustrated ghost were also supposed to play tricks on humans. Halloween is the most sacred day of witchcraft and other occults. It remains a special day for Satanists. It was and is believed by Satanists to be the only day of the year in which the devil’s help could be invoked for a variety of things. Human sacrifice was and is offered on this day. It has and will continue to encourage occult activity on the part of children and adults. It is common for children to pull out an Ouija board and attempt to contact the ghost and spirits that are believed to be roaming about. It helps support pagan philosophies and practices by encouraging people’s interest in things like ghost. Probably no Halloween activity or symbol can be found that does not go back to pagan occultism. For example: Jack-O-Lantern – This comes from a legend of a drunk man named Jack who tricked the devil into agreeing to never come after his soul. As Jack is leaving hell the devil throws a hot piece of coal at Jack. So Jack wanders the earth carrying the coal in a pumpkin. Halloween costumes – Halloween was a night where evil spirits roamed freely and played tricks on the living. So it was to the advantage of people to hide from them or scare them away by wearing costumes. 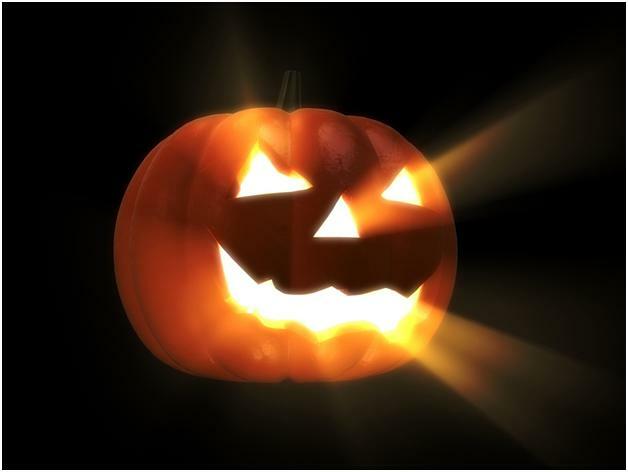 Trick or Treat – This is related to the idea that ghost and witches created mischief on this night. For example, if the living did not provide food (or “treats“) for the spirits than they would “trick” them. When a child goes door to door in the ritual of “trick or treat” he is re-enacting the ancient superstition. Christians participating in Halloween may be a ploy of the devil to mock God. How does God feel when He looks down on Halloween night (in full awareness of the events that have happened on this night) and views Christian children dressed up as ghosts, devils, witches, and goblins? Or, even innocent characters but going out, as those in the world, on the very night that Satan is most honored. Satan, of course, knows the meanings of all of these symbols and so does God. The Bible has many references condemning the practices of witchcraft, sorcery, spiritism, contacting the dead and so forth. Is it possible to glorify God by imitating what occultists do on their special day, however innocently? Historically, this is the very day that evil powers have chosen above all others. Most people think that imitating these things on Halloween is innocent enough since they are not engaging in the original practices or intents. But, what does the Bible say? Christian, is the Word of God going to be your only source for Truth? Are you going to base your life on it? Will it determine how you live? This is a heavy one! I have always done Halloween-with the stipulation that our family will only dress up as funny/silly things or princesses,etc. I did think that in some way our kids were showing the world they could have fun w/o being scary,etc. We do have pumpkins but no other Halloween items. Lately, though, I noticed how many horrible decorations places like target are carrying. While we have avoided all that, I do see the point of understanding what Halloween really is. I’ll be reading yr post with my husband tonight. Thanks for all the details-some of this I did not know. Heather, I know it is heavy. I’m very careful to share my thoughts because I realize how offensive it can be at times. That is the last thing I ever want to do. But the truth is that we are living in the last days and there is a whole world of people who are dying in their sins. They need Christians to shine with the light of truth. If we look, act, dress, and talk like they do and if we participate in the same worldly things, we loose our influence. By the way, my youngest loves to dress up. He has a suitcase full of play clothes that he plays with all year long. I have never felt like my children miss out and I don’t think they do either. We completely ignore Halloween. We keep our porch light off and stay inside. We usually have a fun family evening. I’ll make pizza or something everyone loves and we’ll play a game or watch a movie as a family. I also decorate my house in beautiful fall colors, with leaves and pumpkins. It gets our hearts ready for Thanksgiving. Thanks so much for your boldness and the truth on this subject. Too many people are afraid to go there. We don’t celebrate this holiday and I am so excited to have in words now to explain to others why. I don’t find that hiding under a bushell helps my light to shine, either…I turn on our porch light and hand out the tracks and goodies…we’ve passed more gospel tracts out b/c the kids were asking..now if they read it~who knows. But they got it…that’s my job as a believer. I’ve been in christmas parades and loads of stuff including attending festivals just to hand someone the gospel…yup~count me as one who has done it and will as much as I can. You are soo right, Kimberly. We are to share His light!